With its pleasant handling and excellent performance, the Multiplex Solius offers tremendous soaring pleasure for everyone from the weekend flier to the professional pilot. This over-achieving sailplane is perfect for flat-land and slope sites alike, delivering long soaring flights and lively aerobatics. The Solius features a t-tail, detailed cockpit, clear canopy and numerous innovative Elapor® foam construction details, setting entirely new standards for this class of model. 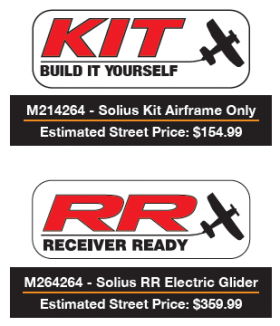 Flown with electric power or as a pure sailplane from high start to aerotow, it is the perfect glider for all.